New York Jets head coach Todd Bowles confirmed on Monday that starting quarterback Josh McCown would be placed on injured reserve. McCown suffered a broken hand in his team’s 23-0 shutout loss to the Denver Broncos. McCown has achieved a season grade of 77.1 through 14 weeks which ranks 22nd out of 38 qualifying quarterbacks. Since 2006, this season has been McCown’s second-highest graded season as his career-best grade of 86.2 came in 2013 with the Chicago Bears. 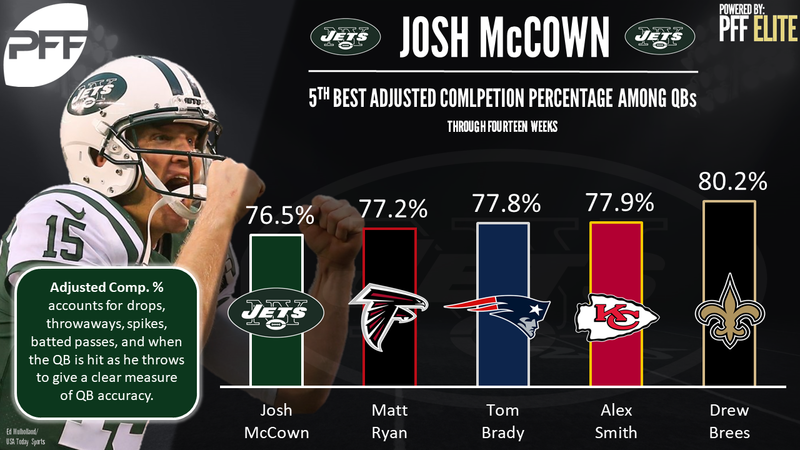 McCown has displayed sharp accuracy, particularly when kept clean from pressure, leading the league with an adjusted completion percentage of 82.0 percent on throws without pressure. However, protection has been an issue for the Jets throughout the season. McCown was under pressure on 38.5 percent of dropbacks, which is the fifth-most among 29 qualifying quarterbacks through 14 weeks. The 16-year veteran has also impressed throwing the deep ball, generating a passer rating of 104.9 on passes thrown 20-plus yards downfield, which ranks fourth in the NFL this season (minimum 40 attempts). 2015 fourth-round pick Bryce Petty will replace McCown as the Jets’ starter. Petty’s only action this year came on Sunday against the Broncos where he completed two passes on nine attempts. He started four games for the Jets at the end of last season but struggled, posting a season grade of just 47.3.